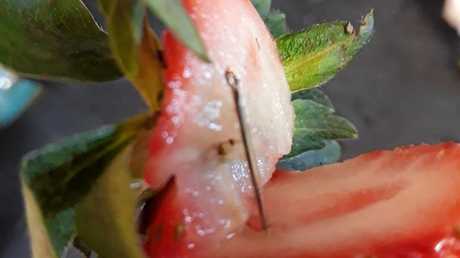 A WEST Gladstone family has found two sewing needles embedded in strawberries they bought from Woolworths Kirkwood. 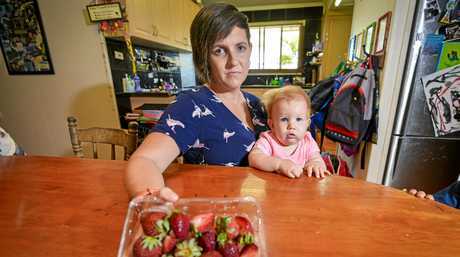 Angela and Aaron Stevenson's nine-year-old son Mason bit into one of the spiked strawberries at school on Tuesday, while Angela discovered the other needle while cutting up fruit for her 12-month-daughter. It is the latest incident in what the Queensland Strawberry Growers Association believes to be the actions of a disgruntled ex-employee. 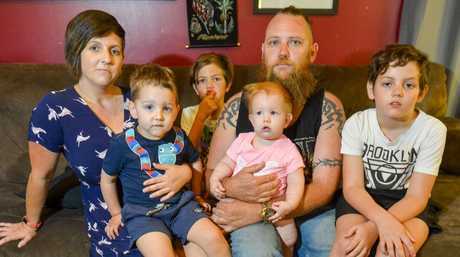 Angela told The Observer she was cutting the fruit for her daughter Koby-Rose on Tuesday morning when her knife hit metal. 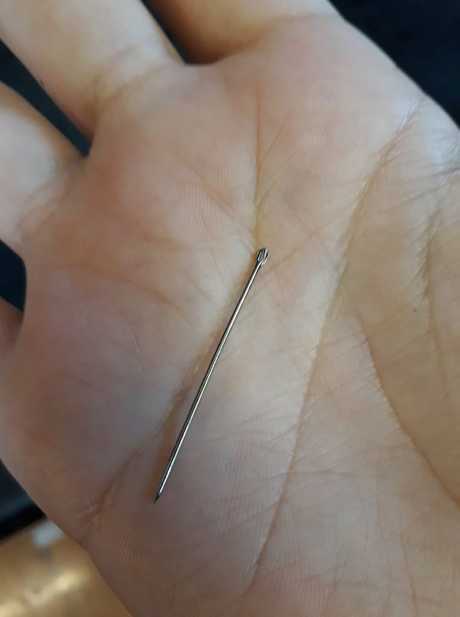 "I had a look and it was the eye of a needle... I pulled it out and there was a needle right there embedded in the strawberry," she said. "I then realised that I had sent Mason to school with strawberries for fruit break, so I rang the school as quick as I could and said tell him not to eat the strawberries. "They rang me back not even five minutes later and said it was too late, he'd bitten into it and he had found a needle." Angela said both she and Aaron were shocked, but thankful that Mason and Koby-Rose were not injured. Aaron said at first they thought it could have been an accident - but quickly realised the needle must have been put there maliciously. "I was shaking when (Angela) found it," he said. "Imagine if she hadn't found it, or if (Mason) had bitten down a different way. "I'd hate to think what could have happened." Angela agreed and said it was "pure luck" the situation had not turned out worse. "Mason knew he'd bitten in to something, so he checked it," she said. "But with Koby, sometimes I just pull the heads off and give her the whole strawberry. "I only just got it by a couple of millimetres, so it was lucky it wasn't pushed in any further. "If it's a digruntled former employee or something like that, like, come on. This is innocent people, kids. "There's sick people out there." The couple called police after seeing a breaking news alert yesterday warning of incidents across the country. Officers arrived at their house that night and took the punnet and one of the needles as evidence. Police believe the contamination has only affected two brands of strawberries so far, Berry Obsession and Berrylicious. The brands are sold in stores in Queensland, New South Wales and Victoria. Woolworths said all Berry Obsession and Berrylicious stock had been taken off its shelves as of yesterday morning. Queensland's chief health officer Jeannette Young said anyone else who had bought the brands of strawberries without signs of tampering should return them to the store or throw them away. "While it is expected that berries picked early last week would now not be useable, many people freeze the fruit for later use," she said. "If you are in doubt, just throw them out." Dr Young said any strawberries bought from September 13 onwards, or that customers are certain are not the brands Berrylicious and Berry Obsession, are safe. "If you believe you have eaten a needle, we would recommend you speak to your doctor or call 13 HEALTH," she said. "There is no reason to stop eating strawberries, we just need to be aware of this incident." Both Angela and Aaron agreed it would not stop them from buying strawberries in the future. "I mean farmers are struggling enough as it is without people boycotting strawberries altogether!" Angela said. Police have urged anyone who finds strawberries containing the needles to contact Policelink for further advice on 131 444.